Are Contact Center “Quality” Scores Improving the Service You Provide? Contact Centers are notorious for having multiple metrics to track the performance of its employees. One of those, would be the “quality score”. Many quality programs leverage; “the list” and “score” to assess the impact of the service it provides. However, most of these programs have a negative impact on the service experience. Not every interaction needs the same approach. Every interaction is unique and should be treated as such. By just saying someone’s name three times to having to mention alternative services is not making the interaction positive. Listening to the specific needs of the client, determining the best approach is what you are paying your associates to do and what your clients expect. I had one experience where an associate used pennies for each conversation, sliding the penny across the desk when they had met something on the “list” – whether it was needed or not to help the client. Having listened to multiple interactions where you could tell the client was so frustrated, wanting the interaction to end and the associate continued so it would be deemed a great interaction. When in all reality it was not. I have also called into organizations, knowing very well they have a list to go through. Most times I will ask them if we have hit everything on their list, not good! Associates are just complying with the program that has been put in place. A recent discussion with an organization, I had asked if they were aligning the internal “score” to external surveys. They like many companies had not. The “score” is an internal measurement, the list and score created to assess the interaction. The most important metrics are 1st contact resolution and net promoter score (NPS). Not an arbitrary score created by a few internal folks. When a client calls, it is the moment of truth for any organization. Most likely the client has already attempted to do their business on the web, mobile app, etc. They need help, specific to them, not a list of items. They probably do not want to contact you again and need their issue resolved the 1st time. Listening to interactions is certainly important, but aligning it to a list or number, is going to just give you just that, a number. You can celebrate the number, but it is really assessing how well you are doing overall? Break away from your lists and scores. Identify a behavior based program, focusing on great interactions and opportunities to change the conversation. Rely on your talented folks to assess the client’s needs and determine the best approach, it is what you hired them for. Ask your client about how the interaction went and would they promote you based on their experience. Evaluate if the client had to call back and why. Based on my experience, not only will you improve your client experience, you have a high probability of increasing your employee engagement as well. The 24x7 Dilemma – Is Your Contact Center Your Competitive Advantage? For the last few years, leading contact center operations, I have created many different scheduling approaches. Creative, innovative opportunities, conducted focus groups, attempting to make working the evenings or the weekends appealing – supporting 24x7. The challenge remains! Continually looking for ways to balance the needs of employees along with the organization’s desire to be 24x7. Volumes are significantly reduced during these timeframes, but you still need still staff. Being creative certainly can help, but it does not change the fact you need to schedule folks during these times. However, most people do not want to work nights and weekends. If you ask, “do we really need to be 24/7”, the discussion will stop immediately. So many organizations consider this the Holy Grail in service. Is it? How many organizations are willing to actually step back and determine if they are really providing service or just answering the phone? I actually did one analysis where we evaluated a certain “products” overnight/weekend calls. 100% of the clients were told to call back, every one! When approaching the product leader, they would not even have the conversation, just indicated, “We are 24/7”! Net Promoter Scores (NPS) tend to be lower at night based on additional analysis I have conducted or reviewed, are yours? Most organizations are unwilling to staff every function and leave the evening/weekend folks to fend for themselves. Is that customer service? Night and weekend scheduled staff turnover is typically higher, impacting the service you deliver. It is a never ending cycle. With the advancement of speech analytics, organizations can analyze the service they provide at every hour and every call type. Determine if your self-service channels are sufficient or if there are other opportunities to enhance your digital channels. · If you tell the client to call back? · Most importantly, you do not have an effective support staff to well, support the employee and client. As a client, “NO”! I would much prefer to hear, we are now closed, and our awesome, experienced staff are here during these hours. Or, please select a time that works for you during these times and we will call you back at your preferred number. Or even better, our virtual agent can assist you with some aspects of your call or schedule a time we can call you back. Unless your services are life/death support or you are obtaining high sales during these times, do you actually need to strain your employees and lessen your service offering to just indicate, “We are 24x7”? 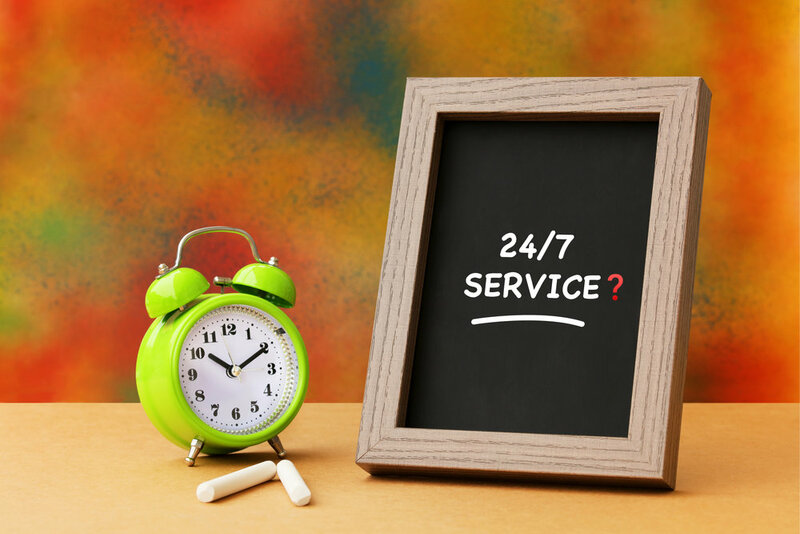 Is being open 24x7 your service differentiator or is the service you provide via technology or when assisting a client what makes you the best? There is so much awesome technology in the marketplace, virtual agents and call back scheduling, to name a few. Leverage these if you need to continue 24x7 support, let your client’s know your most experienced staff will be there to help you at specific times. Schedule your people when you clients need you and you can provide exceptional service during your “live” hours. Your contact center staff should be your competitive advantage not just “24x7” support. When a client calls, they have attempted probably all other options – it should be an exceptional experience. Creativity in staffing is not just trying to fit into what everyone else is doing or attempting every schedule imaginable, it is looking at alternatives and continually assessing how you can best support your clients and engage your staff. Your people are what are going to set you apart. And guess what, most people do not want to work nights and weekends. Is your contact center your competitive advantage? Are you ready to break out of the mold and be disruptive! Want to analyze the service you provide and have a highly engaged staff, give me a call. It has been awhile since I have updated my blog. I have been busy and this is the 1st blog on my newly updated website, Welcome to the Bear Den! It has been a journey and I am learning so much about websites, social media and marketing. Feeding the "learner" in me. I had a chance to conduct a workshop with a team yesterday, discussing their strengths and team dynamics. It was a great session. A very high executing team. We focused on the important aspects of truly understanding and leveraging all of our strengths. As opposed to focusing in on one strength today, I wanted to discuss a broader concept around our strengths: Naming, Claiming and Aiming our Strengths. During the workshop we spent time talking about one strength in our top ten we need to spend more time defining: how this strength works best for us, how it is a part of who we are and if we leverage this strength, what impact can it have in our lives? Most of our top strengths resonate with us immediately. However other strengths, when reading the "one liner" can be challenging; does that really define who I am, or who we are as a team? Even as we learn more, we may shy away from exploring our strength based on other's bias or the "basement" labels that we do not want to own. In reality, we are only hurting ourselves. Those are the strengths we need to explore more, be honest with ourselves about all the great aspects and those that are not so great. Every strength is critical, what makes us dynamic and unique. Understanding and owning our strengths allows us to leverage them in the most effective manner. Defining how a strength works for you, being aware of the impact if we over-use a strength will help you be more productive, more fulfilled and build stronger relationships. I give my readers a challenge this week, think about your top ten strengths. Is there a strength you shy away from? Think, well it is not really not me? Are the barrier labels difficult to own? · How this strength makes you unique? · When you leverage this strength what impact does it have personally or professionally? · What you need to be aware of the effect you can have on others? · Ask others their perspective as well, I always find others insights on how they see this strength in me? Every one of our individual strengths is a part of our fabric. Make sure you are leveraging your strengths! Would love to hear any comments about insights if you take on my challenge. I am conducting workshops in March in Colorado Springs and Denver to help people best leverage their strengths. Denver workshop date will be determined soon.